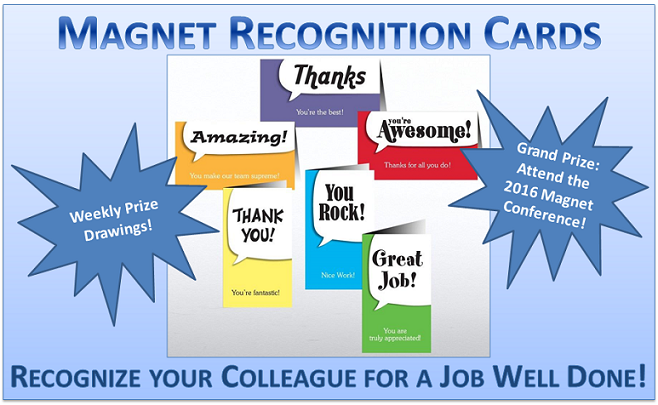 Celebrate the exemplary work you and your unit colleagues accomplish every day by completing a Magnet Recognition Card! Each month, the Recognition Cards will highlight a component of the Magnet Model®, giving you ample opportunities to appreciate your peers for the excellent patient care and interprofessional teamwork they contribute to SMUCLA! Recognition cards can be found on your unit now! Check your unit's tube station or breakroom to find the "Journey to A Magnet U" envelope which houses the Recognition Cards. Once a recognition card is completed and returned to the collection envelope, your recognized peers will be entered into a weekly prize drawing! All recognized staff will be entered into the Grand Prize Drawing: an all expense paid trip to Orlando, FL for the 2016 Magnet Conference!